In France, a small café on the water was called “the frog”, which connected light footbridges that were thrown across the tiny islands to the shore. As a rule, such places were a place where girls of easy-going behavior looked for, who came with gentlemen or alone, dressed defiantly and attracted buyers with clear cries. Perhaps it is because of these cries that they were called “frogs” – they sit on the water, make loud noises, the association could be quite unequivocal. Monet is a famous landscape painter, and even when depicting a splash pool he was more interested in nature than people. Renoir, his friend, painted this place with him, but in his picture people, their poses, and costumes attract much more attention. Monet is fascinated by nature, habitually giving it a little more brilliance than it actually was. 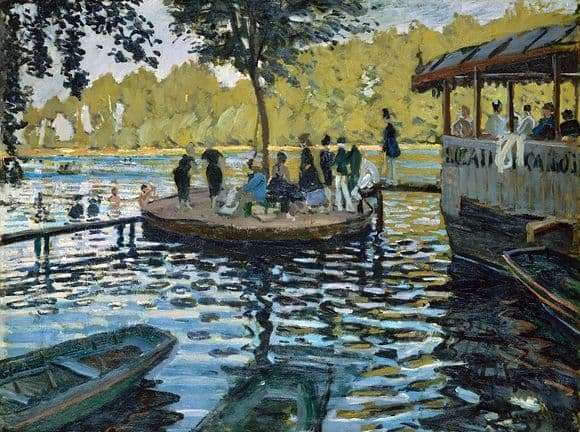 Thin bridges, playground paddling, a covered gazebo, people crowding on them, all this is planned in Monet’s sketchy, light, careless movements of the brush. Without looking closely, it is impossible to understand who exactly is depicted in the picture, and what they do. Even a light green woody background is smeared. But Monet’s foreground is fascinated. The boats are drawn, gently rocking on the waves, and the waves themselves are discharged in such a way that it seems, you can hear them splashing on the sides and on the beach as if the artist only outlined everything else with quick touches of the brush, and he shined his foreground for a long time, admired them, worked on them.